Previous version Gboard 6.3.19.157857933 apk for Android will help you to downgrade or install older app easily. This is one of the best Tools apps. 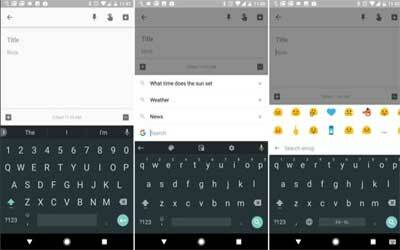 Some of facilities which are presented by Google in this app are the user is able to search directly through the ‘G’ button located on the keyboard. There are also animated GIFs and emoji that have been embedded by default. If you want to use this app, you need to download the APK file and then install it on your device. After that, open Gboard you have installed. At the beginning you will be asked to select input method, you can select Gboard button and then tap done. You will be asked to set up the app, you can select the keyboard theme, text correction, glide typing, dictionary, and more. Well, the install process is complete and you can use this keyboard for your activities. One of the features that we like about this app is the “G” button that we can use to search for something on Google. In addition to search, it also has share feature, so we do not need to copy-paste to share the result. This keyboard is the best keyboard we’ve ever used on Android. Text correction and text prediction goes very well so it is able to accelerate the typing process. Overall, Gboard works great and it has the best features for Android. Word completion suggestions, automatic corrections, and next-word prediction based on the words you have typed. Choose a layout with or without key borders to suit your style. Gifs are great addition. The integrated search is nice, though I hope to see it evolve and to allow more than just the first result to be viewed. Dedicated number row is also very welcome. It is now at the stage where no third party alternatives really offer anything different or better. Nicely done.